Mothers love to receive handmade gifts from their children, especially on Mother's Day. 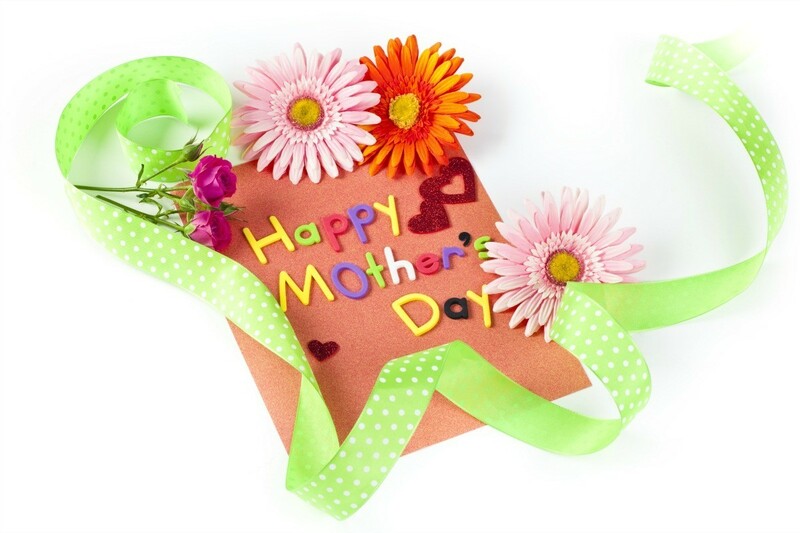 This is a guide about Mother's Day craft ideas. With Mother's Day fast approaching, here's a fun gift to make for a special Mom. 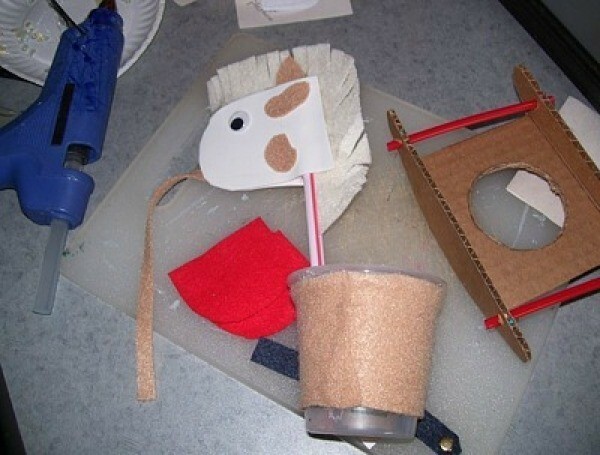 If helping a child with this project, the adult can cut the cardboard pieces and work with the hot glue while the child can decorate the horse and fill the cup with goodies! You will find the materials it takes to make, most likely in your home already so it's a great way to recycle and be creative. I used a hobby knife to cut the pattern pieces from a discarded Folgers coffee corrugated box. Scissors may cause bends. I also used hot glue to assemble the horse. It made the project go faster and there was no waiting for glue to dry. Cut 2 rockers from cardboard. It has to be corrugated because the rockers need the thickness. Punch holes in the rockers where indicated, going slowly so you do not bend the cardboard. I used a metal knitting needle. The size of hole will depend on the straw size you use. Insert straws, one end at a time and assemble rocker. Do not cut length of straws yet. Cut 2 small rectangle pieces from cardboard, about 1/2 x 1 inch. You will glue these to the inside of the rockers which the cup base will sit on. See picture. They need to be level on both sides so the base sits square. You will glue them on about 1/4" down from each rocker edge. Put your cup onto circle in the center of the cup base to make sure your size cup fits. If not, just draw around the base of your cup and cut out hole. I used a cup that grapefruit slices came in, but a yogurt cup would work also. Any cup about that size should do fine. Then cut out the base square. Adjust rocker so base drops in and rests on the 2 small rectangles. Take base out and run regular glue down both sides. Put some hot glue on top of each small rectangle and insert base. Hold firmly until glue sets. Paint the rocker in your choice of colors and decorations. 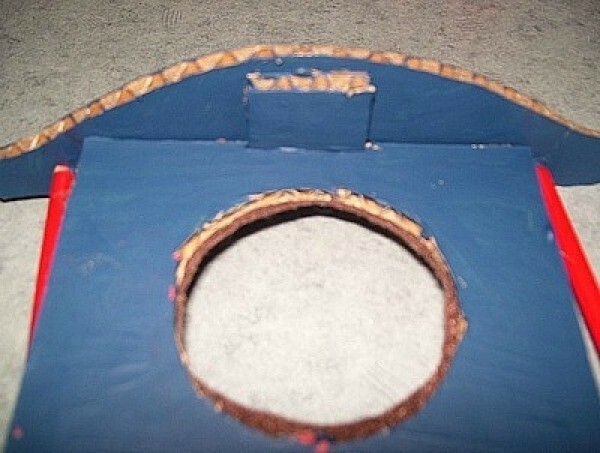 When dry, cut cup base cover from felt and glue on top of base. Cut straws so only a small length sticks out from rockers. To hold straws in place, glue a bead on each or insert a pin with a dab of glue on it through the center of the cardboard and each straw. 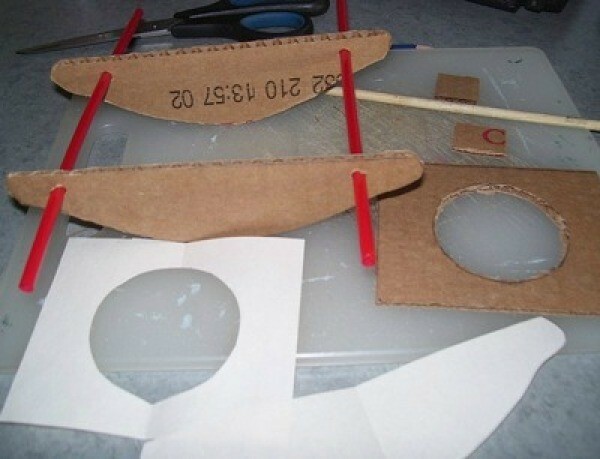 Push in until pin is hidden within the cardboard. Measure and cut a strip that fits around the cup, but leave about 1/2 inch of cup exposed at bottom. This will be give it room to drop into the hole in the base. Glue felt on to cup. Cut out felt for saddle and glue one to each side. 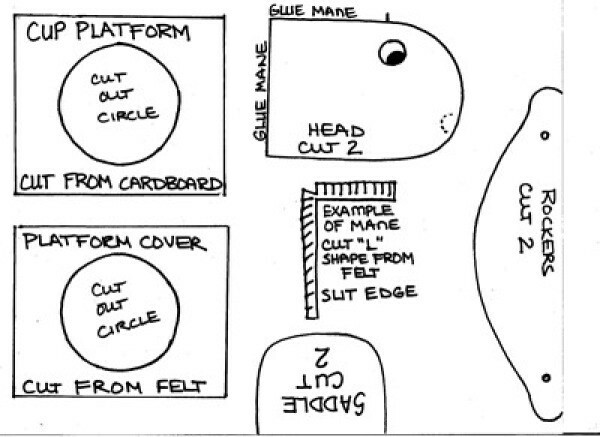 Cut out head and use diagram to cut out mane. Just cut out an "L" shape and make slits with scissors all down one edge for mane. Glue mane to one side of head, then glue a straw next to it. You want to sandwich the mane and straw for the neck between the 2 head pieces. Press seams of head firmly together until glue is set. Glue straw into cup against one side. Glue on eyes and draw nostrils with marker. I attached some trim for a harness with dabs of glue and added pom poms. 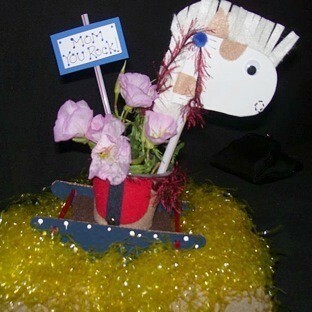 You can decorate the horse any way you choose and fill the cup with goodies or flowers. If the rockers don't stay balanced once the horse is in it, just add something with some weight to the cup or slice off a small amount from bottom of rockers. Make a sign to add to the cup that says, "Mom Rocks!" and you are sure to make her day! 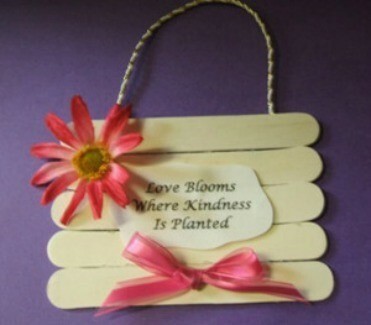 Show Mom that her kindness is appreciated by giving her a pretty plaque you made yourself. 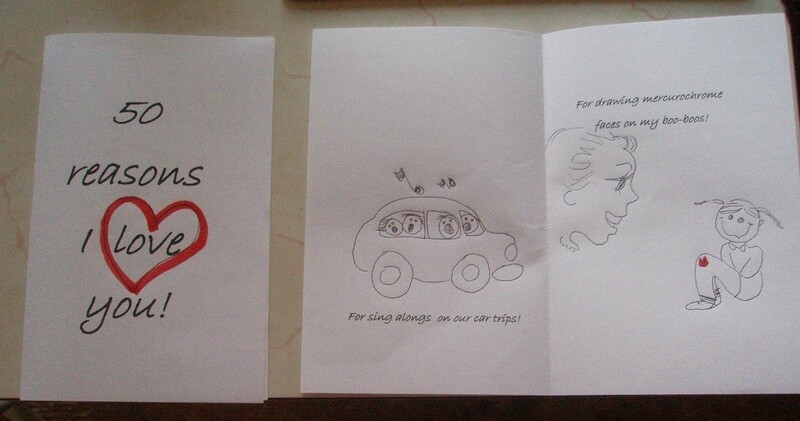 Here's a Mother's Day craft we did at church this year with the younger kids. It's very easy to do and inexpensive. Write the letters M O M on your construction paper. You could also use copy paper and run it through a copier. I am looking for a Mother's Day craft project to do with my cousin's 18 month old. Does anyone have any ideas? Not sure what it's called but at craft stores, they sell a kit that you use to get the child's feet or hand print. It's not plaster of paris like used years ago. It's a soft malleable substance and comes in pink or blue and I think comes with a wooden plaque to put the shape when finished on. That would be easy and memorable for the mother. Or you could have a pair of the child's shoes bronzed. On thriftyfun a few months ago, someone posted a cute wreath made from construction paper that they used the child's hand prints for as the wreath, that would be cute at that age. What about taking some cute photos of the child, maybe 10 and put them in a small photo album for the mother. With spring here and all the flowers in bloom, some photos with flowers would be cute as your subject theme then create a pretty poem to go with them in the album. My boys and I did a hand print tee shirt for their dad when they were little guys. I used a black shirt and white paint. After patting their hands in the paint I would hold them by the wrist and sort of shake the hand to loosen the fingers and quickly plop them down on the shirt. I put heavy cardbosrd inside so the paint didn't run through. Our boys are 22 & 21 now and the shirt is still being worn by Dad! When my son was about that age, I made cards with blue handprints on the front. I did one for all the mothers in our family. It didn't matter how messy they (or my son) turned out, it was still precious. A cute idea (wish I would have thought of this years ago!) would be to include a photo of the little artist during, or after, the creation. That is a good idea for any craft that you are giving away. My daughter-in-law made a tee shirt for Grampa. It was the painted hands, but on the back at the neck like a HUG. She also did the baby's behind. The front she painted with "best Grandpa in the world..."NO IF AND OR BUTTS about it!" So cute! Use Plaster of Paris and a paper plat and place child's handprints or footprints and find a cute saying about mothers. You could also paint his hand and place them on a T-shirt or scarf, apron, etc. (Use fabric paint). http://familycr  /l/blhugsgft.htm This is cute. I did this with a small box and ripped color tissue up made a mix of glue and water like modge podge. Let then brush glue on or you and they can stick paper everywhere and then print saying out and then tie off with a ribbon! Moms loved this! I also used a piece of ceramic tile and did their hand print in paint and wrote the name and date! we made stepping stones one year with cement in a pie pan and my kids put colored stones and marbles in there and other things we did it for grandma and 6 years later still has it in her yard!!! I make this every year with my two year olds, take an old baby food jar. take off the paper, clean real good. Use finger nail polish to paint on the jar. 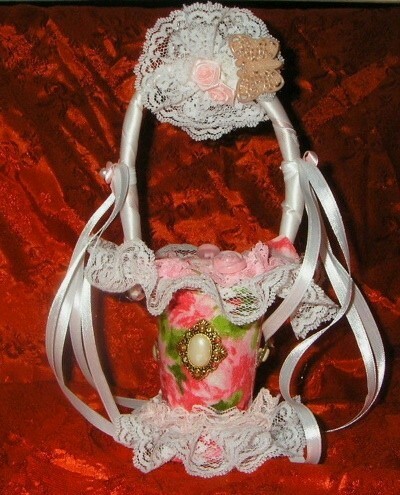 Tie a ribbon around the top and put a small candle in it and you have an inexpensive and fast candle holder. obviously, you will want to watch the children closely when they are painting, that they dont try and eat it. If it gets on any surface, use finger nail polish remover. Hope this helps! I am captain of a Relay for Life team that raises money for American Cancer Society. For fundraisers, we enjoy making and selling things for each holiday (such as crafts or food items). For example, we are making and selling large candy Easter eggs for $5 each for Easter. I wondered if anyone had any suggestions for foods or crafts for Mother's Day and Father's Day. Thanks in advance for your help. a. 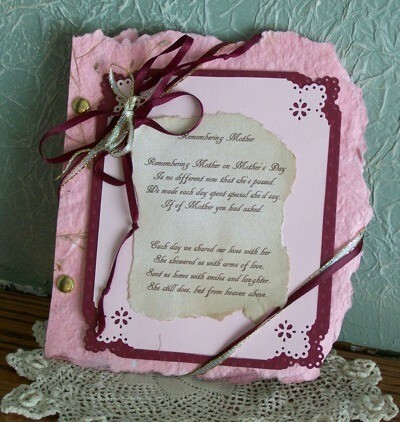 For both days, you can make bookmarkers, with ribbons and beads for Mom and painted on card for Dad. Paint on initials or zodiac symbols for more personalized items. b. Decorate old bottles (wine, gin) with glued on beads or with sea sand (nicer than common sand) and use for a single flower or a nice dry berry branch or wheat. If you can cut the bottles, make them into candle holders. c. make special dinner sets from felt/fabric or woven ribbons. Buy some plain gift bags and hand decorate with sequins, raffia, etc. & sell them. Everyone uses gift bags from time to time. How about making and selling all sizes of tye-dye T-shirts? Make & sell inexpensive goody bags for kids. Buy your stuff at a dollar store, Walmart & other stores might donate, if you tell what it's for. Buy some plain white pillowcases & decorate in children's cartoon characters, some adult themes, & sell them. Best of Luck, whatever you choose to do! Does anyone have any Mother's day craft ideas? Since Mother's Day is tomorrow, it will have to be a quick and easy craft. How about a plastic canvas cross. Homemade Mother's Day gifts are always a hit. 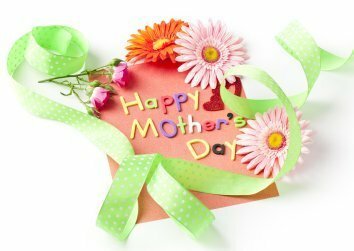 Whether it is the construction paper artwork of a small child or a handicraft made by an older one, moms love handmade gifts. This is a guide about homemade Mother's Day gifts. Take leftover drinking straws and a recycled container to make these pretty little blooms. It's perfect for kids to make and Mom or Grandma is sure to appreciate it. 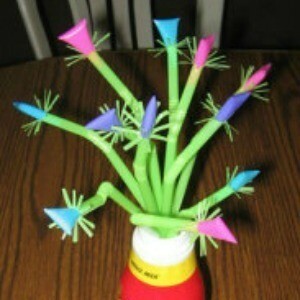 This guide has instructions for making a bloomin' straws bouquet for Mother's Day.